If you live in Rockwall, Texas, you know that storms are a serious concern. Thus, it important for you to know more about emergency roofing repair so that you are in a position to handle the threat of roofing damage. Even more important is having a reliable emergency roofing repair service that can respond quickly to your call when you need a hand in protecting your house and the valuables therein after a roofing damage occurs. When do you know you need to call Beneficial Roofing? Everyone needs an emergency roofing repair partner. A tree limb can fall on any house and take out part of the roof in a second. At Beneficial Roofing, we receive so many calls from Rockwall residents and a significant percentage of them involve tree falls, while others are after storm hits. When the season for heavy rains or strong winds kicks off, you better be sure that the building you call home or office is safe and reliable. Age and decay usually weaken the roof and the whole structure. When adverse weather comes, it’s very easy for the roof to start leaking water in. You don’t have to face the nightmare of roof damage when Beneficial Roofing is only a call away. Call the roofing professionals whenever you feel or see the signs of a leaking roof. They are always delighted to serve Rockwall communities because at Beneficial Roofing, caring about the safety of everyone is the main business. And if you aren’t sure that there is a problem with your roof, let the professionals inspect it and they will figure everything out. Water spots (usually yellow in color) on the ceiling or water stains on walls. These two signify slow leaks and they could result in expensive repairs. When your gutters clog more frequently than normal, water may pool on the roof and cause serious damage. Call Rockwall emergency roofing repair immediately you realize this problem to have the gutters cleaned or repaired. Breathing problems, allergic reactions, and intestinal problems are possible outcomes of living in a house with roof damage. They are often caused by an accumulation of moisture that encourages mold growth. 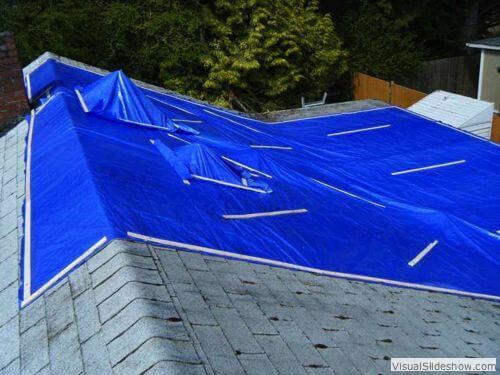 We also offer emergency tarp service, as it is one of the best ways to protect your roof and the house from further damage. It’s also a requirement by most insurance companies that a temporary roof covering be installed before they inspect the roof damage. So, if you don’t have a tarp, don’t hesitate to call Beneficial Roofing and you’ll be provided with one. One thing that every customer of Beneficial Roofing will attest to is the company’s fast response time. The company takes emergency repair calls very seriously because it understands the anxiety that comes with roofing damage. Beneficial Roofing is Rockwall’s rock when it comes to emergency roofing repair. Regardless of the size of roofing damage, the roofing experts will receive your call anytime and drive to your location with all the required equipment for repair. Yours is just to find a safe place away from the damage. don’t wait and call us today to get a free inspection and we promise to provide you the best available services in the market today.